Discount Guantanamera Cigars cigars store have the lowest online prices on cheap cigar. 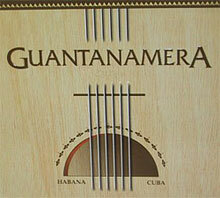 Guantanamera cigar line was launched in 2002 on Cuban factory ICT. Guantanamera's are very mild cigars originating from the Vuelta Arriba region, and are very competitively priced. This is the ultimate Cuban cigar for a beginner or for any cigar smoker who likes a very mild and light bodied cigar.